It’s not unusual for people to ask the Registrars questions that we don’t know the answers to. It’s also not unusual that we make a bit of an effort to find the answer. On this occasion we actually had to go to an awful lot of effort and put in many hours of research, but in compiling the register of every DBS built, we have managed to answer so many more questions than just the total number of manuals built, and to uncover the truth about the most talked about car of the Gaydon Vertical Horizontal (VH) era. An article by Adam Towler in the November 2015 edition of Evo magazine considered the used Aston Martin market. Along with the well considered comments from the Club’s own then deputy chairman, Mark Donoghue, and the sales manager for Nicholas Mee & Co, Bryan McMorran, it clearly promoted the idea that the next ‘DB5’ and the car ‘to have’ was the manual DBS V12. Thus, in a heartbeat, the manual DBS became the most desired previously owned VH Aston Martin. 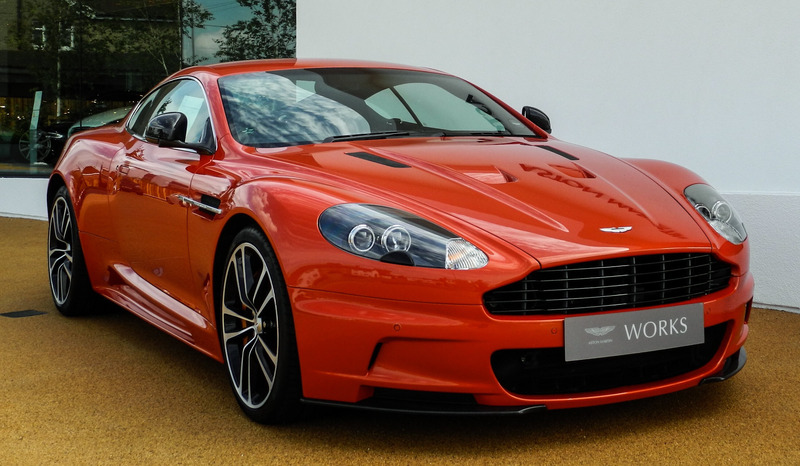 Shortly after publication, in an email from a Member, we were told that he dearly wanted a replacement for his V8 Vantage Roadster and he informed us that the manual DBS cars were selling at a phenomenal rate. No sooner advertised at a higher price than the last, they were sold, probably sight unseen. There was no problem in finding Touchtronic 2 cars, plenty of choice although the breadth of colours was, to our eyes, a bit uninspiring. Some quite well-informed individuals have had an educated guess at DBS production numbers but there is a total lack of real hard facts. No-one really knew how many cars were potentially out there… until now. The car was first announced in January 2007 as a high-performance derivative of the DB9, what would have been called the DB9 Vantage if top management had conformed to previous Aston Martin naming conventions. Also slated as the latest Bond car for the upcoming film Casino Royale, the DBS V12 would be rarer, lighter, faster and visually tauter than the regular DB9. A design sketch was released that showed something really rather special, thus prompting orders and letters of intent to come flooding in. It was also announced as the first Bond car to be driven by the untested Daniel Craig. The standard manual transmission was also anticipated despite false reports about Craig being unable to drive a manual car – a relief, no doubt, as apparently ‘that’s how spies drive’. With hindsight, the early marketing strategy was a shade risky – if Craig had bombed as Bond, how might that have affected demand and sales for the new Aston Martin flagship? The DBS V12, it could be argued, started with one hand tied behind its back. The intention was for it to replace the much-loved Newport Pagnell-built V12 Vanquish S, a car with a loyal and well-informed following. It was slightly less powerful, with a slightly lower top speed and it lacked the Newport Pagnell cachet. It could also be said that the conventional manual gearbox was AML bottling out on the forward-looking robotized paddle shifters of the V12 Vanquish, although it was the first Aston Martin with carbon fibre brake discs. Whilst certainly more masculine in appearance than its sister, the DB9, many thought the V12 Vanquish had a visual edge. Yet, point to point, the DBS V12 was claimed to be a faster car which is probably correct – it was 0.7 sec quicker in the vital dash to 60. 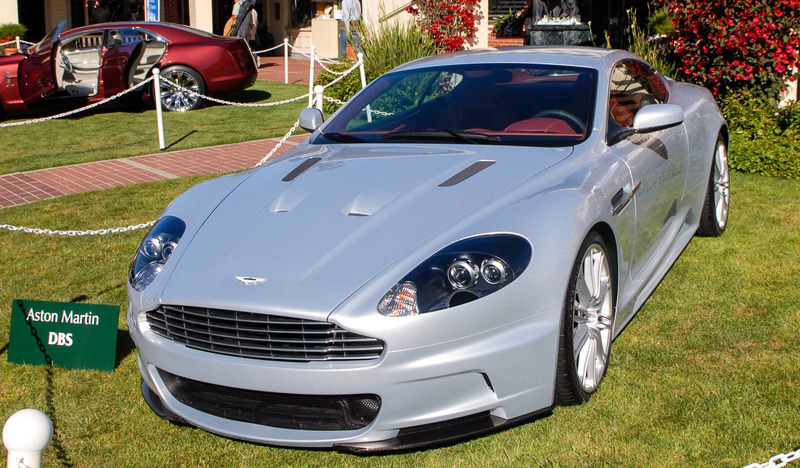 Revealed to the public at the world famous Pebble Beach Concours d’Elegence in August 2007, the same year that Aston Martin was the featured marque, the silver two-seat Super-GT attracted great attention. At launch, the DBS V12 could only be specified with six speed manual transmission and 2+0 seating configuration, exactly as featured in the Bond film Casino Royale. 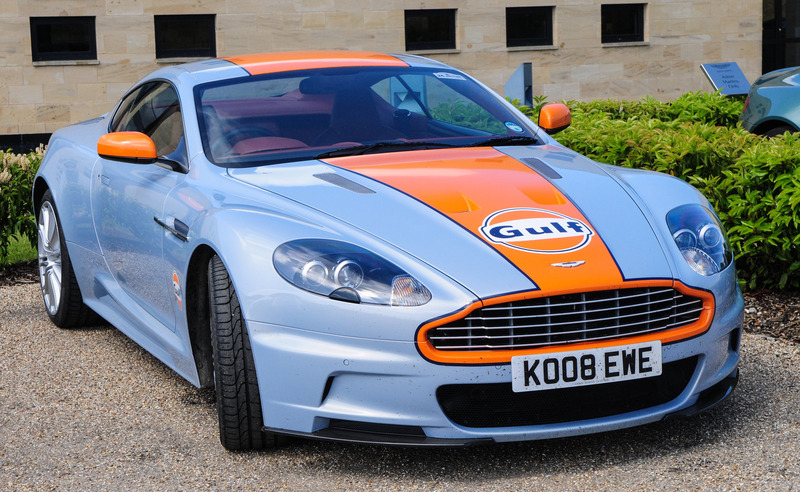 Production began in earnest late 2007 and continued through five model years until the car was replaced, by the new ‘VH310’ Vanquish, in late summer 2012. 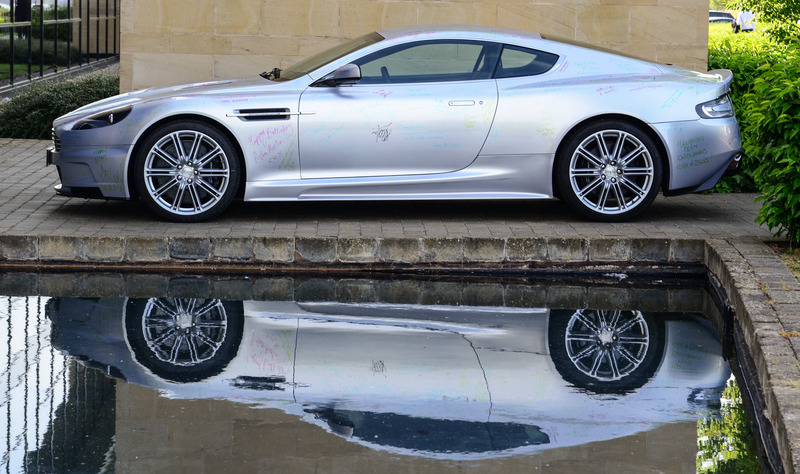 During this time, production of the DBS V12 coupe only reached 2534 examples, making the car significantly rarer than the DB9/Virage coupe by a factor of about five. This does not include the eight known prototype and development cars and neither does it count the six known DB9 prototypes that were used during the early development of the DBS V12. Where the car becomes especially interesting is in the range and combination of basic specifications. In 2008, part way through the 2009MY run, the Touchtronic 2 gearbox became an option which by 2010MY became the default choice. At about the same time, 2+2 seating also became an option that again quickly became the norm. Whilst the permutations are by no means endless, the mix of model year, hand of drive, transmission and seating configuration actually make studying the DBS V12 really very worthwhile indeed. The raw figures are this, 2534 built over a 5-year period with 1609 being left-hand drive. This leaves 925 with right-hand drive but not all of these were supplied for the UK market. Other right-hand drive markets include Japan, Singapore, Australia, New Zealand, Ireland and South Africa. So far as we can ascertain, the total number of United Kingdom supplied cars was 726. The graph shows the MY split of righthand and left-hand drive. Almost all of the 30 2008MY cars were factory demonstrators. 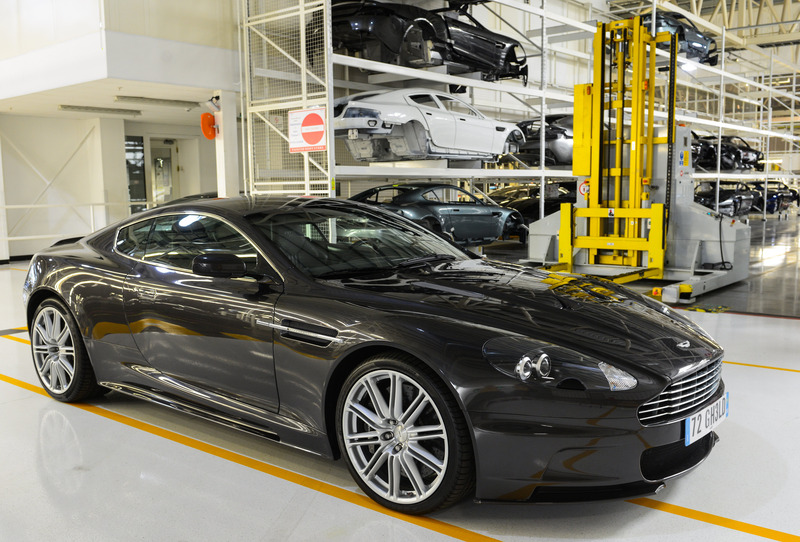 2009MY cars make up the majority of the production run of the DBS. 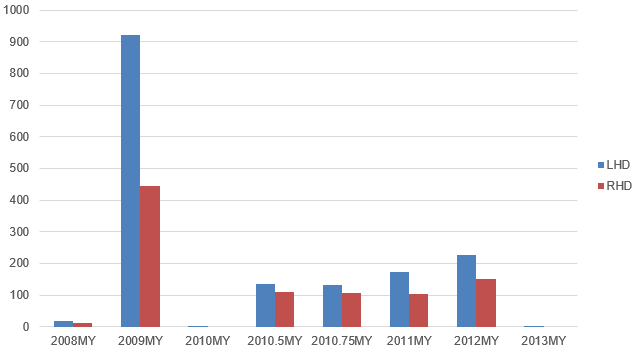 The 2010MY cars are made up of three partial years, 2010, 2010.5 and 2010.75, where production might have spread over a period greater than 12 months. The sole 2013MY car was probably a VH310 Vanquish mule that has not survived. The next important consideration is the split between those cars supplied as manual and those supplied with Touchtronic 2 transmission. The manual is the scarcer of the two but maybe not as much as many would expect. A grand total of 984 DBS were built with the manual gearbox, which is more than a third of the total build. Of course, to begin with, the car was launched as manual and significant numbers of Touchtronic 2 cars were only produced from about chassis number E00800. A few words about the seating configuration. As we have already stated, the 2+0 cars were launched first and significant numbers of 2+2 cars did not arrive until about chassis number E00750. Once the 2+2 became the default option, only about 15% of subsequent production was 2+0. There were a fair number of generously spec’d special editions starting with the Carbon Black, the UB2010, the Carbon Edition, the Dragon 88 and finally the Ultimate. If space allowed, we could keep breaking down various combinations of cars but you would probably soon get bored, so, we will give you a flavour of the most common and also the rarest combinations that you may encounter. The pundits say that the most desirable DBS V12 is a manual 2+0 but this isn’t that rare, with 870 examples. Remember the early, fastest selling cars were all 2+0 manual. Far rarer is the manual car with 2+2 seating, only 114 were built. Similarly, the most numerous are the 2+2 Touchtronics which number 1550. Another scarce car to look out for is the 2+0 Touchtronic 2 with only 345, almost all built for distant markets such as the Middle East, Russia and the Far East. For the UK only 27 cars with two seats and Touchtronic 2 were built. All-black cars are not to everyone’s taste yet 157 Carbon Black coupes were built and sold over a period of 21 months. Manual Carbon Black cars are incredibly rare, with only four known, all left-hand drive, so don’t expect to find a right-hand manual in the UK. The Carbon Edition was a later development of the Carbon Black but with the additional options of Flame Orange and Ceramic Grey in either gloss or satin paint finish. In total 84 were sold, all but two with Touchtronic 2 transmission; both of the manual Carbon Edition cars were left-hand drive, built for the North American market. Rarest of all are manual Ultimates: of the 59 built, so far as we can ascertain, there is just one with a manual box and that is also a left-hand drive North American spec car. Of the rare highly limited UB2010 coupes (10 built) and Dragon 88 coupes (eight built) all were built with Touchtronic 2. Being a Bond car twice over, the colours used on the film cars were very popular. Casino Royal-painted cars account for a huge 368 DBS V12 Coupes, almost 15% of total production. Of these, 251 can be considered as true Bond replicas with both 2+0 seating and a manual gearbox. Quantum Silver cars are also popular with 354 built but interestingly, as these were built later in production, only 32 had the authentic 007 manual gearbox and 2+0 seating combination. This number actually includes the 10 especially made for the film so making them especially desirable, even though these cars are not actually a licensed 007 product. The DBS V12 has just about the highest black/grey/silver score of any Aston Martin ever, with 72%. Finding a non-black/grey/ silver car in the UK, Europe or the US is especially difficult as these markets score almost 77%. A rare red, green or blue DBS shouldn’t be seen as any more precious but is especially unusual and interesting. Black is the most prominent colour, skewed by all the Carbon Black cars. The single most common colour is Storm Black (414) closely followed by Casino Royale (368), the launch colour Lightning Silver (349) and Quantum Silver (354). There are 36 other colours used that only feature on a single example. One-77 excepted, the DBS V12 was the effective halo car of the Aston Martin range for a period of 5 years. Sandwiched between the iconic V12 Vanquish and the more advanced 310 Vanquish it has maintained its desirability because of the Bond connection, its sharp styling and the dirtiest of exhaust notes. It also featured some notable and interesting Aston Martin firsts. First with carbon fibre coachwork, first with carbon brake discs, first with lightweight carpets and first with B&O audio equipment. The economic slowdown that affected sales of high-end cars including Aston Martins limited the production of the DBS V12 for its entire lifespan. This is perhaps why it is such a rare car and especially desirable with the now trendy old school manual gearbox. Only 6 years after production ended, ‘future classic’ status is assured and the DBS V12 is looking to gain a cult following among Aston Martin devotees reserved for only the most desirable models. I would like to thank Aston Martin Quarterly (AMQ) magazine (David Lewington is the editor) and the authors Tim Cottingham and Chris Bolton for graciously allowing me to reprint this article that originally appear in the AMQ Summer 2018 Edition Volume 52 No 219 Registrar’s Corner feature on pages 8 through 10 (you can find the original magazine format of the article here). Tim is the Aston Martin Heritage Trust registrar and keeper of the data. Tim also runs the great website AstonMartins.com (that you can find here) that is absolutely a wealth of resource for anyone interested in the marque. When I am on his site hours disappear as I read through the great information and photos. You should definitely check it out. You can learn more about the AMOC (including how to join) at www.AMOC.org. AMQ magazine is one of the great benefits of membership and you can read more articles like this written by other Aston enthusiasts. I’ve been an AMOC member since I purchased my DB9 and recommend you check it out! Very informative. The DBS is something I would love to aspire to but the difference in cost however and the frequency I use my 9 would probably mean my other half would have Micky fit. Lovely never the less. I have some really good information to share with you about the DB9 manual. The manual DB9 was first offered in the US starting in 2005. From 2005-2009 it was an option to have a DB9 made with a manual gearbox with only about 3000-4000 total units produced. There are only about 1000-2000 that were actually brought to the USA. It would be nice the have an accurate breakdown of car options and production figures like you had in your DBS article since the ones I mentioned are not precise. Hi Jay. I agree, it would be great to see more details on the DB9 models. I’ll pass this along to Tim Cottingham (AMHT Registrar) and share the results if allowed. Thanks for the information. As an owner I often pondered the question. My dealer did send me an advert for a similar spec car to mine. It was reassuring that apparently mine hasn’t gone down in value. Hi Vince. Glad Tim’s article help answer that question. I’m envious of the DBS. I am a proud owner of a DBS, Manual, 2+0, LHD, Black interior. Would it possible to receive the Excel database used to produce the different DBS statistics ? 251 cars produced being “Casino Royale Bond replica” (Casino Royale Manual 2+0), but how many of them are LHD with Black interior ? Thank you very much Tim ! I have just realized that I forgot to say it, now it’s done. You are soooo lucky to have access to this database. I would play with it for hours and hours. Many thanks! The AMHT register of Aston Martins (formally the AMOC Register) has been around since 1948. It’s my role to keep it updated and it’s quite a task. The Trust is finding a way, even in these times of GDPR to make the information more available to marque enthusiasts. It is an absolute privilege to be the current registrar and I’m absolutely anxious to live up to the standards of the past. I served my apprenticeship on AstonMartins.com and look forward to the time that I can dedicate more time to the task. Many auto journalists have said over the years that the DB9 was the prettier of the two cars and I definitely agree. I’ve never really understood the purpose of the DBS other than perhaps selling Price as the product. The DB9 was never a numbers car. No one bought it because it was the fastest or most advanced luxury GT available. So why make a marginally faster and uglier car in the way of the DBS? Now I’m not saying the DBS is an ugly car, but when your older sister is a super model, nothing short of perfection will do. I don’t think Jay’s data about the DB9 numbers are correct. Have a look at the NHTSA docs and fix log on RA-18-0026. It says there were 1953 DBS AND DB9s made during 2005-2009. What percentage of DB9s were available as a manual? And like the Vanquish before it, I wouldn’t be surprised if AMWorks one day started offering manual transmission conversions for the DB9/DBS. I’m pretty confident on my manual “DB9 coupe” figures since I got them from the Aston dealer, BUT would like to see the precise breakdown if anyone can produce them please post?? Tim, Do you know how many manual DB9 coupes were made? They were first offered in the USA starting in 2005. From 2005-2009 it was an option to have a DB9 coupe made with a manual gearbox. I was told by AM dealer the following: Only about 3000-4000 total DB9 “coupes” units produced. There are only about 1000-2000 that were actually brought to the USA. 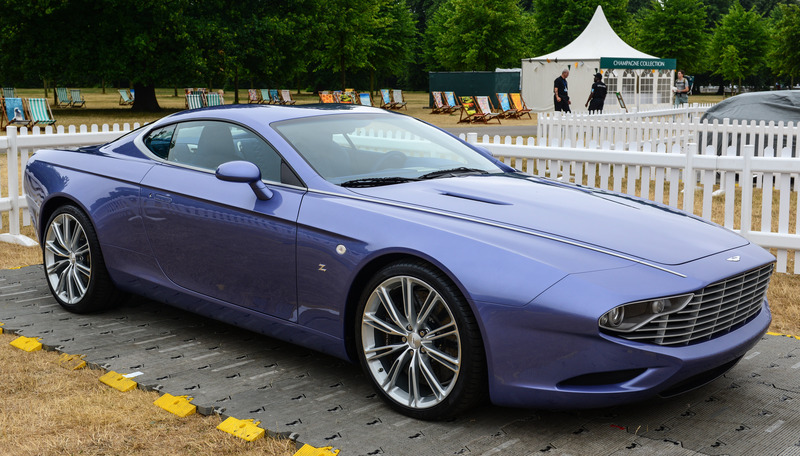 It would be nice the have an accurate breakdown of DB9 “coupes”. Can you provide them Tim?